Digital Business Ecosystems – Ecosystems will reshape the future of Financial Services as banks look to change the way they engage with and support customers to provide value-added services that reinforce their underlying business ecosystem vision. This may be fuelled by a need to keep up with ‘new’ service providers such as FinTechs and InsurTechs or with traditional Technology companies like Amazon becoming increasingly involved in the banking sector. To be successful, these new Business Ecosystems will need to bring together the firm’s Digital Platform Strategy Mobile, and an open Application Programming Interface (API) approach to ingest data sources from the Internet of Things’ (IoTs’) ‘things’. It will need access to powerful Analytics from the programmable economy to help firms go beyond traditional banking services and think about specific events and experiences where data or distributed business models can enable a better customer experience. This will all need to be supported by an Enterprise Cloud strategy, and it needs to happen now for Banks, Asset Managers, and Insurance companies to shift into a successful digital business. 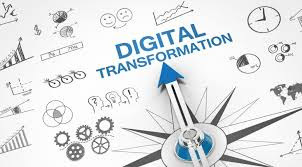 Technology-led transformation – When discussing digital transformation, it is impossible to strategize on an action plan without a heavy focus on Technology. In 2019, firms expect to update systems to become future-ready with a modern, flexible technology architecture. This will include accelerating the move from monolithic business systems to a microservices architecture and adopting an Open API strategy to support “beyond banking” business models. In terms of front-end engineering, this means ramping up design thinking for more customer-optimized, usable user interfaces (UIs) that shift to AngularJS. This full-stack technology transformation to a more flexible technology architecture also will require a hard look at Cloud strategy. Data as a Horizontal – Digital Transformation has been fuelling a massive growth in data available to banks, asset managers and insurance companies available for analysis and further business value. Given the vast amount of data created each day, it is considered one of the banks’ most valuable assets - but only if it is properly mined and the value is extracted. Data analytics, data mining, data lakes, and data visualization tools are essential to assign value to the immense amount of data being created and to use it to better understand and target customers. While 2018 moved AI strategies beyond simple automation to more complex Data Science focused use cases, 2019 will set the stage for the push toward enterprise-scale Business Intelligence and further advancement of Data Science strategies to achieve business return on investment (ROI). Given the anticipated, continued exponential growth of data, firms should also start to prepare for their five to ten-year data strategies which should think about things like Quantum Computing and Ecosystems. "2019 will really push forward the future of financial services and see immense change take place. We expect that this year will see the start of ecosystems that bring together some key technologies that aim to provide more effective methods of engaging with customers. We cannot wait to see what 2019 will bring and look forward to leading the way on this new and exciting journey for financial services," said Faisal Husain, Co-founder and CEO at Synechron.